Really, even though I'd been thinking about it alot, I had no business actually doing it. But I did. 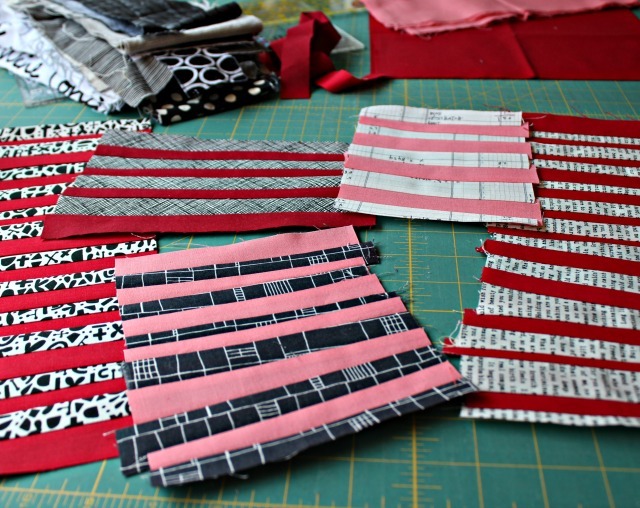 On Saturday, at a Seattle MQG sew-in, I was sewing through my scraps making oodles of improv quarter-log cabin blocks. When I went, I had 12 blocks made, and by the end of the weekend, I have 26! So I've made good progress. But in rummaging through those scraps, I discovered more black-and-white prints than I expected, and it came to me they might go good with the red+pink flamingo combo I'd been mulling over. So in spite of all those log cabins blocks, a class sample that should've been done already, and the new project I had totally intended to start on next, I began cutting and sewing something new.... you know, just to see if it was worth really pursuing. And I think it is! What led me here was a circuitous and improvisational journey - from Improv Alliance with its spikes, which were repeated in Greenery, along with the addition of stripes - to this new project where stripes will play a key role. I find I often work like that, with one thing leading to another. In some odd way, it provides a thread of continuity that I really enjoy. And even though progress on this one may wait just a bit, I can't wait to get back to it! Sometimes we just have to scratch an itch! I like how the blocks have come together so far and I hope you can get back to this project for more play sometime soon. I guess lots of groups had sew-in's this weekend. I was invited to one (I'm not a member of the guild) and it was a lot of fun. Enjoy seeing your progress! Following an idea can lead to something amazing and unexpected. Can't wait to read more about this project and see your finished project. Love your 1/4 logcabin blocks! 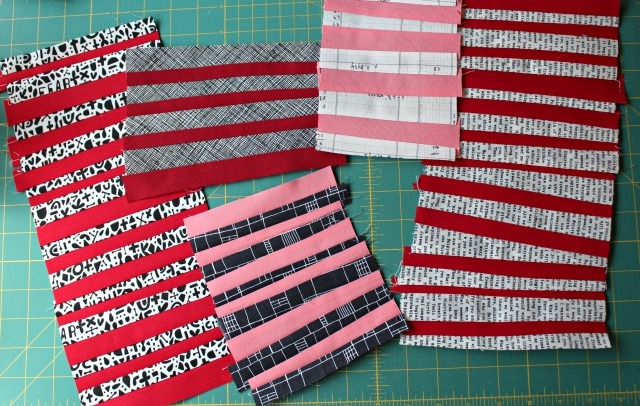 And you can't go wrong with the improv combo of b&w with red & pinks... it will look great! Loving your string blocks so much! It's wonderful how projects segue right into the next one. The funny thing is, the next one in line often ends up being the better quilt! What a fabulous start to something amazing, I'm sure. Love where this is going!!! Sometimes the things we have no business doing, we actually have tons of business doing! This is great! Wow! Who would have thought! I am loving this! 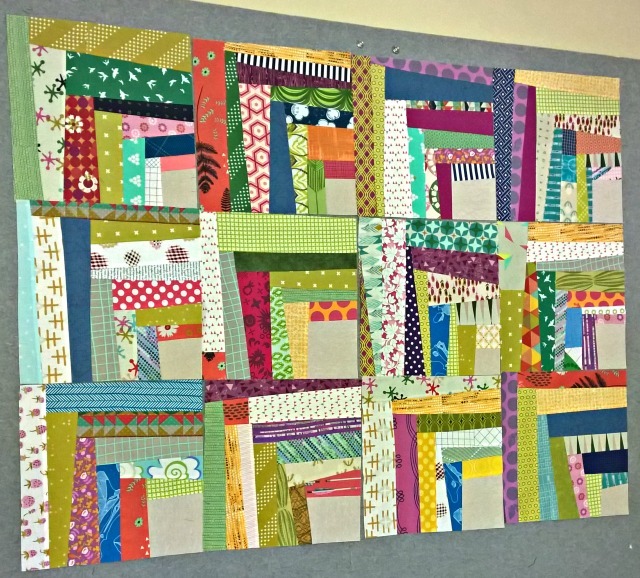 Your string block project looks great ! I love the combination of pink and red. 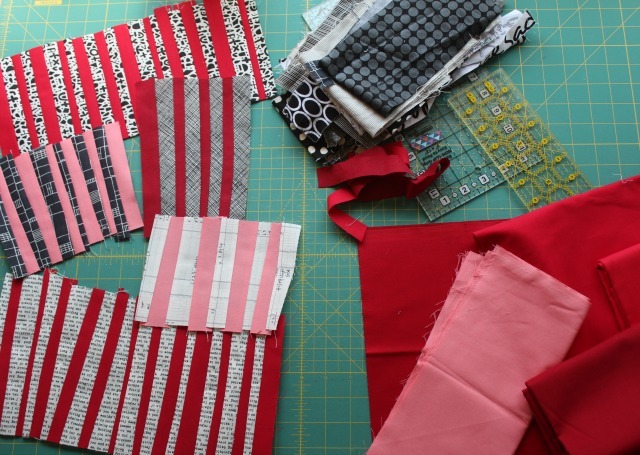 Wow, you got a lot of sewing done :) Your inspiration looks interesting. Even if it has to wait a bit, I am sure you will come back to it and we will see more. I am currently on a "ban" to not start a new project or I will lose my motivation Partner. It's a bit of a game... lol. But I definitely don't need new projects before I finish some.